My Erasmus experience truly began the day I received my UCC admission letter. I was finally holding something concrete that made me realise I was going to study in Ireland for one semester. From that moment onwards, time flew so fast that I found myself in Cork sooner than I had expected it. I had already found an accommodation before arriving in Ireland but I would advise any future Erasmus students not to do that. I had tons of problems with my landlord and I think it is much easier to find a cheaper and well-located accommodation once you are in Cork. I also advise people to share a house with Irish people rather than with Erasmus students because that is the best and sometimes only way to speak English with native speakers. Since it is difficult to be integrated with Irish students, you will probably spend most of your time with other Erasmus students who may not always speak English very well. Therefore, living with Irish students is certainly the best solution to improve your linguistic skills. 1) They definitely don’t have the same sense of hygiene as us. Don’t be surprised if one of your roommates uses your toothbrush or your facecloth. 2) They are not able to cook a meal without burning it and therefore, you will hear the fire alarm ring only twice a week if you are lucky. 3) To avoid awkward situations, don’t say to one of your girl roommates that you have met an Irish girl with the most outrageous mini-skirt you have ever seen, she will probably have the same. 4) Don’t panic if you don’t understand them at first, you will quickly get used to their particular pronunciation. And don’t be surprised at all if you hear them say “you know” and “I was like” every two words, something very irritating when you live with an Irish girl talking all the time. Besides finding an accommodation, choosing the courses I was going to follow during the semester was another important stage of my Erasmus. It was difficult to make up my mind and decide which course to choose in the large choice of courses UCC offered to Erasmus students. I felt relieved once I eventually had completed my first learning agreement in Belgium, thinking that I wouldn’t have to think about it anymore. Though, when I arrived at UCC, the international co-ordinator told me that half of the courses I had chosen were not available anymore and that I had to make another choice. I had to go at least six or seven times to the International Education Office to get all the authorisations I needed to follow modules that both suited me and the administration. But I quickly forgot these administrative details and truly enjoyed the fourth months I spent studying at UCC. I was really impressed by the architecture of the campus as well as by the courses we could follow there. First of all, the architecture of the buildings on the campus was an interesting mix between old and new and you could have class in old buildings such as the Quadrangle as well as in more recent buildings such as the O’Rahilly Building. Besides the fact that the campus was beautiful, it was also very big and it took more than 15 minutes to go from one side to the other. And last but not least, I’ve never a seen a university offering a so large variety of courses. Everyone can find something made for him/her in the many courses proposed at UCC. What is special is that Irish students can barely choose any course they want. For example, someone studying microbiology can also follow a French translation class as well as a Greek mythology seminar. I think it is a nice system but I’m wondering what the Irish students are specialised in at the end of their studies. -The Irish. What I liked the most about Irish people was their casual attitude. Irish people never seem to bother about what other people may think about them and they never look stressed. What is also nice with them is that they are always ready to help you when you need it. And last but not least, Irish people never worry about time or schedules. They are always at least 15 minutes late and don’t find it embarrassing to come 20 minutes late in class. I must admit that I found this last characteristic absolutely pleasing! However, saying that Irish people are absolutely perfect would be lying. If they are very welcoming and friendly when you first meet them, they become distant and indifferent as soon as you try to know them better. Besides, they don’t care much about hygiene and cleanliness and I have observed some gory things in the shower siphon. -Trips. Ireland is a splendid country and we have seen some breath-taking landscapes while we were travelling around Ireland with Sophie and Elisa. The most beautiful places I have been to were Dublin, Kinsale, Youghal and the Ring of Kerry. I regret not to have visited the Northern Ireland and I would advise anyone going to Ireland to visit as many places as possible in the beginning of their stay when they don’t have too many things to do. Otherwise, it will become difficult to organise longer trips once you will have to work for your different classes and you will come back home without having seen half of the places you wanted to go to. -Friends. 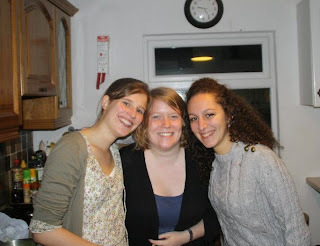 We met a lot of other Erasmus students coming from all over the world at the beginning of our Erasmus. It was really nice at first but then, asking a thousand times to different people where they came from and having superficial conversation with them became boring. Moreover, people speaking the same language tended to stay together and it was quite annoying to hear French people asking you to speak French with them because “zey” didn’t speak English very well. Hopefully after a little time we met good friends we really got on well with and this added another dimension in our Erasmus experience. -The fact that it rains everyday in Ireland is definitely not a legend. So try not to forget your raincoat this time. -Irish people drive on the left, so look right before you cross the street if you don’t want to die after two days. -When other Erasmus students ask you to come to a pub for Arthur’s day, don’t ask everybody who and where is Arthur in order to tell him happy birthday. Arthur invented the Guinness and he died a long time ago.